If you don’t already know, on Wednesdays, until the end of July, we film San Diego’s hottest talk show The Break, created by Lady Xplicit and I Am Strictly Business. We blogged about it last year, check out what we had to say. This year, regular filming is at 7 pm pacific time on location at Jolt’n Joe’s in the Gaslamp Quarter in downtown San Diego. There is no cover to come see a live performance and everyone is welcome. You have to be 21 and up after 10 pm. The season finale filming date is July 18th, we’ll get you more information on what’s happening for that a little later. Episodes broadcast on Wednesdays at IamStrictlyBusiness.com and DagoSD.com. This Wednesday will be our first special edition. We’ll be at the Dorrough concert presented by Wolfpack Entertainment. Dorrough will be performing his hits Ice Cream Paint Job, Get Big, Walk dat Walk and much more. 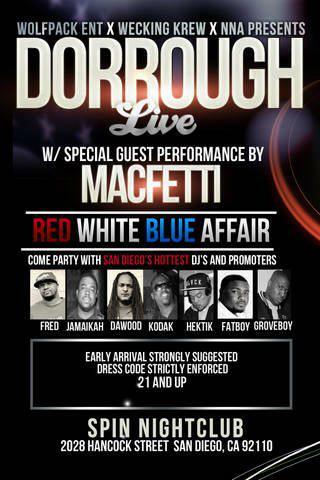 Special guest performance by Macfetti and additional music by DJ Fat Boi, DJ Hektik, DJ Grove Boy and DJ Fresh. The concert will be held at Spin Nightclub, 2028 Hancock Street, San Diego, CA 92110, from 10 pm to 3 am. Contact Fred of Wolfpack Entertainment at 347-731-8187 for tickets to this event. Filming the show outside of the usual format is much anticipated for our team, starting the day at the beach and then working our way to Dorrough. This episode will be filled with lots of beach time, fun time, performances and an exclusive interview with Dorrough. See you all there music lovers!